Adventure Game Studio | Forums | What is a good font for a 320x200 game? Topic: What is a good font for a 320x200 game? What is a good font for a 320x200 game? Apologies if this isn't the correct board to post this on, but I've been having a lot of trouble finding a readable and good looking font to use for a 320x200 resolution game. They are generally either too small to read, or way too big. Anyone know any good fonts to possible use? Any help would be super appreciated! Re: What is a good font for a 320x200 game? I got a remake of the old Quest for Glory font, that's a very nice font. define "too small" and "too big"
I always prefer the lucas arts fan font that Ghost remade . Perfectly readable for me but that one is maybe too bold for you, am I right? 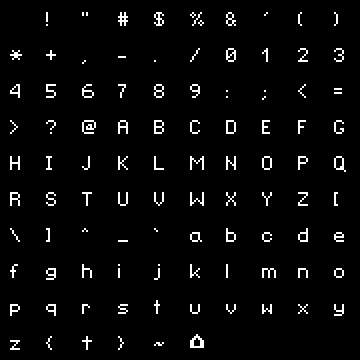 IDK if relevant, I just wanted to say that there is a known issue with "Lucas Fan" TTF font on Linux: Free Type library cannot draw it properly (some pixels are misplaced). I agree, the issue seem dubious. Maybe it is a subjective feeling, or you do not use proper scaling filter? I remember Ben Chandler used very small fonts in his first games, IIRC he even composed a font 4px high; yet they were still readable. 4px? Do happen to know the name of this font? I am really intrigued! I made this: https://www.dropbox.com/s/gll18bcozlontv1/WESTWOOD.WFN?dl=0 based on screenshots from old Westwood games. I made a mistake, it was not Ben304, but san.daniele. Thanks for the replies guys, much appreciated!! Crimson Wizard: That small font is the one I'm currently using, it's pretty good and I will use it in some form. Kris: That font looks great - how do I use a .WFN format font in AGS? EDIT: Managed to convert the WFN file using Radiant's FontEdit. Great font! Kris, would you mind if I used this in a game?